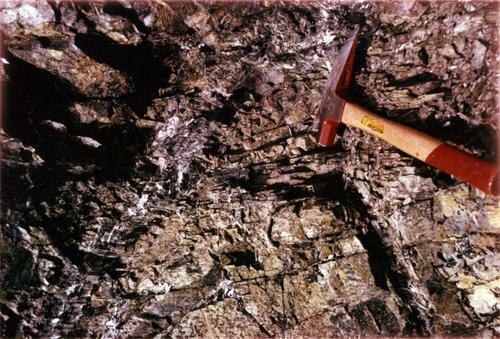 Photograph depicts a geologist's hammer, believed to belong to Cassiar's Chief Geologist Bill Plumb. The hammer provides a scale for the exposed asbestos, indicating the percent of fibre in the rock as well as the expectation of grade. Stamped annotation on recto in black ink: "SHARE YOUR FUN SEND PICTURES".